Justin's face in the last panel is inspired by the face people usually give me when I tell them I haven't seen some classic movie from their childhood. In particular, it is inspired by the look a cashier gave me when I told her I had never seen The Princess Bride. To be fair, many people drop out of tournaments after a certain point because some tournaments have such large attendances that they go on for hours and the players who decide to leave early aren't having fun anymore by round four or whatever. I've done this myself at least once, and I fully admit I might have stayed if I'd had a shot at a prize. The process of figuring out this comic's layout beat me up and took my lunch money. 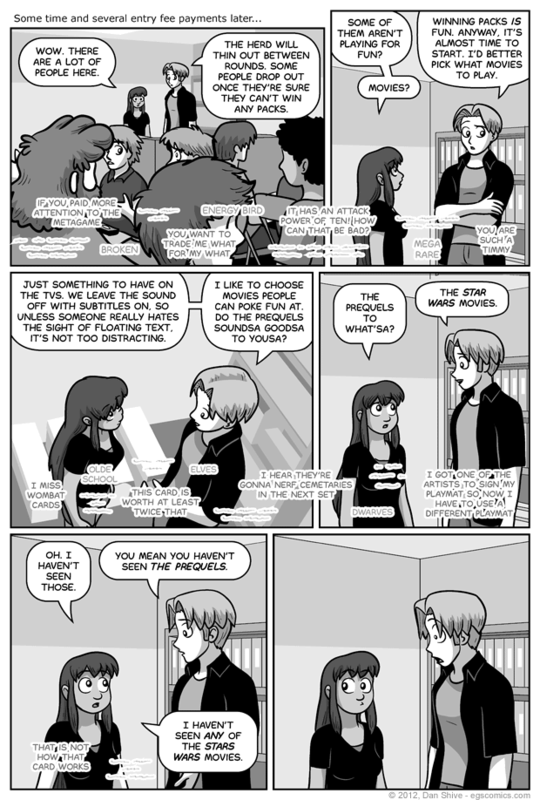 Between Grace and Justin's height difference and the fact that the lower third of every panel was being used up by crowd chatter, I wound up having to do several dialogue edits just to accommodate the bizarre limitations I had effectively given myself. Which isn't to say the height difference is a bad thing. I like the character variety, and it functions as a pathetic attempt to get on John Troutman's good side. The issue in this comic is that I only really gave myself the middle third of the each panel to work with while focusing on two characters with a full head of height difference between them. Basically, sorting out the composition for this comic was kind of like playing Tetris on one of those hard difficulties where there's already a mess of fallen blocks to deal with.